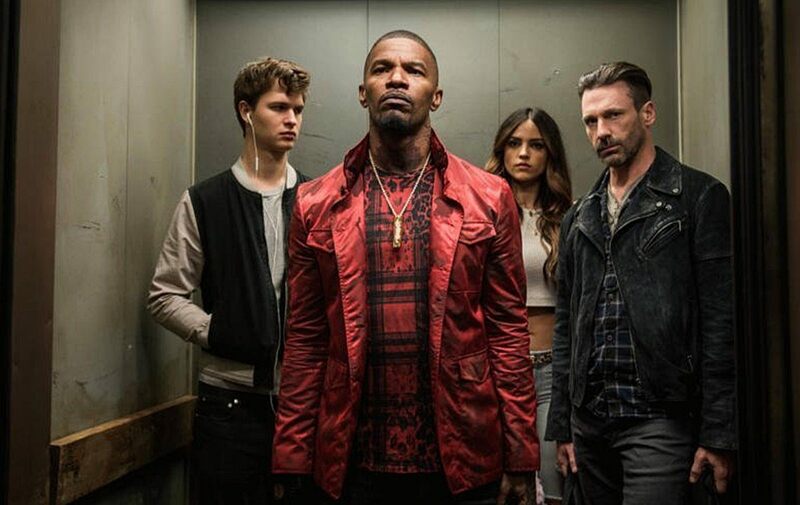 When so many studio movies come off as safe, assembly-line, personality-free products connected to a franchise, writer-director Edgar Wright’s “Baby Driver” is alive with bona fide flavor and energy, flooring it with an identity all its own. Wright, he of 2010’s “Scott Pilgrim vs. the World” and the Three Flavours Cornetto trilogy, never lets his vision turn too arch or self-indulgent when concocting a bracing tossed salad of a genre picture. It’s a heist caper, a love story, and a visual mixtape all thrillingly rolled into one crowd-pleasing joyride. When almost everything clicks in a movie, it is like a shot in the arm for cinephiles, and “Baby Driver” is a creatively fresh, criminally fun and awesome rush. If it isn’t the most thematically meaty film of the year, few others this year will match this one's infectious exhilaration. Baby (Ansel Elgort) is a young man of few words, but he’s great at his job as a getaway-driving prodigy in Atlanta. An ace behind the wheel, he works for Doc (Kevin Spacey), a filthy-rich kingpin who hires criminals to pull off different heists. Since he was in a car accident that took the lives of his parents and left him with tinnitus, the earbuds to his iPod never come out when he’s driving because the music drowns out the ringing in his ear and keeps him moving; he even stealthily records snippets of conversations to make mixtapes. Baby lives and takes care of his deaf foster parent, Joseph (CJ Jones), who wishes he would get out the criminal world, and that is a part of Baby’s plan, as he keeps a savings under a floorboard in his apartment. Before he’s straight with Doc, he accepts one more job: a post-office robbery with couple Buddy (Jon Hamm) and Darling (Eiza González) and the unhinged Bats (Jamie Foxx). In the midst of all this, Baby goes against Bats' advice (“The moment you catch feelings is the moment you catch a bullet”) when he meets a friendly waitress named Debora (Lily James), who has the singing voice of an angel, at the diner where his mother (Sky Ferreira) used to work, and their mutual love for music is what makes them fall in love with each other. Will Baby’s last job go off without a hitch? Can Baby and Debora follow through with their plan in hitting the road with their music and escaping their old lives? 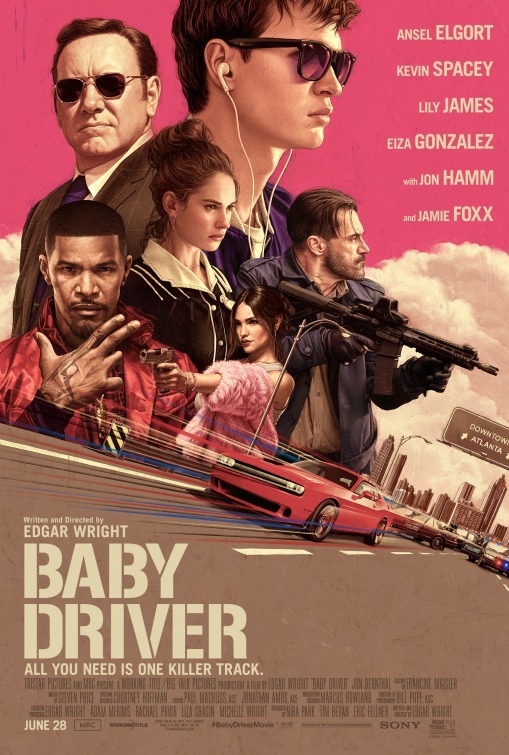 Stylish, exciting and wearing its beating heart on its sleeve with a soundtrack to go with it, “Baby Driver” moves like a high-wire act, gliding when it could fall at any moment. The film crackles with wit (there is a great Michael Myers/Mike Myers joke), and though no one breaks out into song, the film has the precisely timed tempo of a musical. Each cut is synchronized with the beat of a song, evident in none other than the slick opening car chase, cued up to Jon Spencer Blues Explosion's "Bellbottoms," in which Baby, Buddy, Darling and Griff (Jon Bernthal) in a red Subaru WRX are pursued through downtown Atlanta, down a tight alleyway, and on the freeway by cop cars and helicopters. It's wholly riveting to watch and impressively choreographed, and that's just the first scene. Another early sequence is joyously orchestrated in an unbroken tracking shot where Baby simply takes a walk to get coffee for himself and his criminal passengers, and the third act’s breathless on-foot chase is a masterful study in how to shoot and pace an on-foot chase. Similar to 2014’s “Guardians of the Galaxy,” the soundtrack is germane to the story, rooting back to the protagonist’s relationship with his mother, and it is chock-full of '70s funk, like The Commodores’ “Easy," Bob & Earl’s “Harlem Shuffle,” Carla Thomas' "B-A-B-Y," and The Champs' "Tequila," that are less obvious, more deep-cut choices. In the case of the film’s love story, there is a true sweetness and spark between Baby and Debora, who form a couple deserving of our concern because they feel like soul mates, based on common interests and not because the script demands that they be. Familiar to the world mostly for his work in YA book adaptations, first the now-defunct “Divergent” series” and then 2014’s “The Fault in Our Stars,” Ansel Elgort is already a star that it’s a surprise his career is just now taking off. As Baby, though, this is Elgort's true breakthrough performance, as he gets to be cool, charismatic as hell, yet good-hearted and vulnerable. Fresh-faced and instantly sympathetic, the lovely Lily James (2016's "Pride and Prejudice and Zombies") brings much more to Debora than just “the love interest,” and her scenes with Elgort alone are enchanting, particularly one where they listen to a song in a laundromat. Not every character receives deep exploration because all of them (except for couple Buddy and Darling) are strangers working a job, but every actor is well-cast and makes an impression. Jon Hamm and Eiza González (TV's "From Dusk Till Dawn") are memorable and unpredictable as a Bonnie and Clyde-type couple who seem to get off on their crimes, and Jamie Foxx effectively walks the tricky tightrope between funny and threatening as Bats; his scene in a diner booth where he tries to predict Buddy and Darling’s backstories is written, acted and shot with chilling tension. Finally, Kevin Spacey is slimy and deadpan as mastermind Doc, managing to not just chew up the scenery but work in a “Monsters, Inc.” joke and even garner a sliver of sympathy. Style and attitude might be prioritized by design here, but they're not everything. Not unlike Ryan Gosling’s Driver, also a getaway driver and a man of few words, in 2011’s “Drive,” one genuinely cares what happens to Baby and the good people in his life. 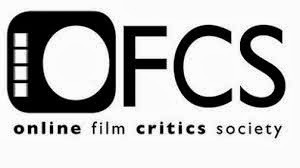 With the heavy output of so many mediocre action films that try palming off noise and Cuisinart editing as high-octane excitement, it’s truly a miracle to find a film that executes those moments with controlled shots, longer takes and tight, beautifully rhythmic editing (hats off to cinematographer Bill Pope and editors Jonathan Amos and Paul Machliss) but also gives us a reason to care about the outcome and the characters. Despite the film seeming like it could have ended a few moments sooner, Edgar Wright finds the right ending, and even if he didn’t, he had already pulled out all the stops and hit the sweet spot for movie lovers again and again. A blast of cinematic ecstasy, “Baby Driver” is exactly as cool as it strives to be, affirming that they still do make quality summer movies like they used to.